I’ll take a vodka martini shaken by a 43cc motor (but not stirred), please. 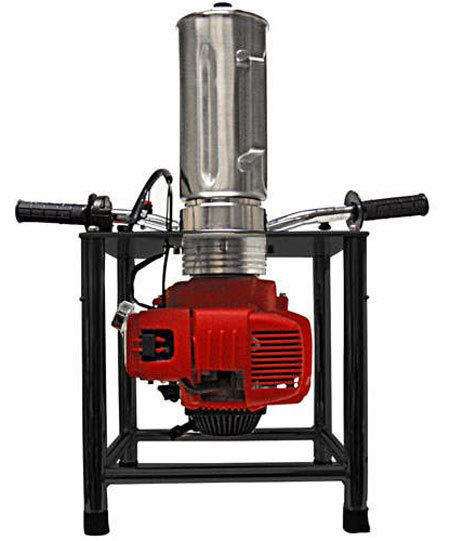 Sam’s Club offers this two stroke 43cc gas powered blender exclusively to its members as an in-store pickup item. It’s not available in California, which means it’s a pollution maker. And it’s made in China, so don’t let your kids chew on the stand. On the plus side, this beast has diamond-plated accents, a stainless steel blender cup, and variable speed throttle, so you can mix your chosen poison at your chosen RPM. Pricing: $100. Yet another last minute gift idea for the man with WAY too much time on his hands. Hahaha, awesome!!! I love the motorcycle style handle bars. I would love to pull that thing out at a party and ask anyone if they wanted a margarita!!! So i was cleaning out my garage and saw one of these in my garage(have no idea how it got there). Brand new if interested let me kno. Do y’all have any of these available still?